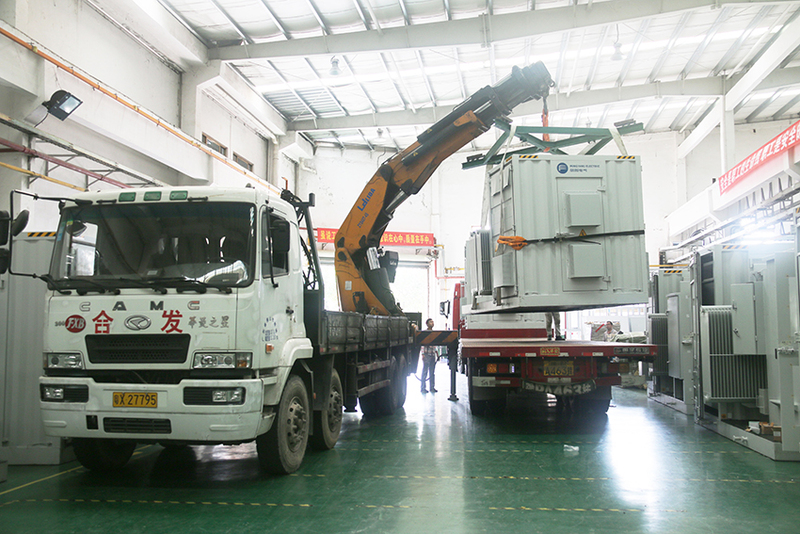 On June 3, Mingyang Longyuan loads the photovoltaic inverter boosting integrated devices onto the truck, and duly delivers to the site of the Gushi Jimin project of Shanghai Baozhi Group. This is another manufacturing task of 630 duly delivered by Mingyang Longyuan. The photovoltaic inverter boosting integrated device is a solution for one-stop DC input initiated by Mingyang Longyuan.It has the characteristics of inversion and boosting output, high integration, high stability, quick pre-installation, high profitability, strong adaptability, high compatibility, etc., it is provided with the most advanced control method and technology, and it is the equipment which can meet the income expectation from investment of the customer in one stop. The model of the photovoltaic inverter boosting integrated device used by the GuShi Jimin Project is MYsolar-1250-TW, and the maximum power of this model of product can reach 98.07%. The Mingyang Longyuan photovoltaic inverter boosting integrated device is provided a built-in integrated DC cabinet, a transformer, a high-voltage cabinet and a medium-voltage power network, it optimizes the circuit breaker as well as anti-thunder, power supply and monitoring equipment, and it reduces investment in AC cables. The service temperature range is within minus 30℃ to 60℃, which comprehensively considers the requirements of air exhaust, heat radiation, sand-proof, rain and snow prevention, corrosion protection, low temperature resistance, etc. The equipment finishes debugging when leaving the factory, and it is only required integral hoisting on the project site, which realizes quick pre-installation and meets the requirements of one-stop transportation, installation and maintenance.